“Goopy” isn’t a word used too often when writing about food. Am not sure why, but perhaps because there aren’t a lot of things that are goopy, that you actually want to eat. Mont d’Or has been called the holy grail of French raw milk cheeses. It’s goopy for sure, and if that bothers you, well, that’s something you’re going to have to work on for yourself. In the meanwhile, I’ve been lapping up this Mont d’Or I recently acquired, enjoying every single goopy mouthful. Called “the holy grail of raw milk cheeses”, Mont d’Or (also called Vacherin Mont d’Or, and Vacherin Haut-Doubs) is truly a spectacular cheese. And even though they’re widely available in the winter in France, because of their richness, it’s something I reserve for special occasions. For me, that special occasion was lunch yesterday. According to French Cheeses, the origin of this cheese was a point of contention between the Swiss and the French for centuries, with the Swiss finally conceding to the French. 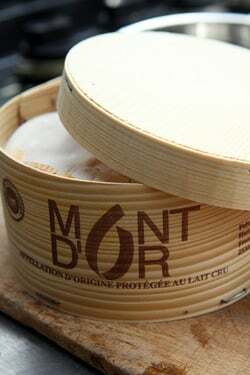 I’ve read further and the kerfuffle between the two countries resulted in some confusion in names: In Switzerland, it’s called Vacherin Mont d’Or, whereas in France, Vacherin refers to the same cheese molded and ripened in large wooden hoops, and the smaller ones, packed and sold individually, are called Mont d’Or. On a trip to Switzerland, I visited a cheese-maker who specialized in this cheese and noticed their cheeses were a bit lacking in that barnyardy flavor (another food-writing word to avoid?) and I learned the Swiss versions are made from pasteurized milk. In France, you can get both versions; those made with lait cru (raw milk) and the pasteurized ones. (Tip: Go for the lait cru.) 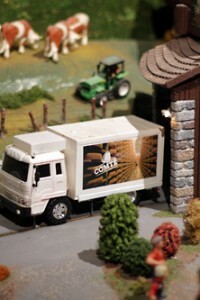 The cheese is ripened for about three weeks in the spruce boxes, which give the cheese a particular flavor. In spite of the European Union cracking down on things like wood used in cheesemaking in favor of stainless-steel and plastic, Mont d’Or is a protected cheese and must be ripened in wood. So for now, the cheese appears to be safe. And let’s hope it stays that way. (Just in case the EU is reading this site.) The only real problem with Mont d’Or is that once you pull a warm one out of the oven, and start eating it, it’s impossible to stop. You might have trouble finding one, depending on where you live, and their season is short; in France, we start seeing them stockpiled at the <>fromageries around November and December, and they are available throughout the winter, with interest declining when the weather turns warmer. Folks, I gotta tell you, this is one amazing cheese and if you get a chance to try one, you won’t know what hit you. I’ve had a few in my life that were exceptionally good just as is (unbaked). But when baked, it’s like a brain wreck of everything going on – fat, funk, fresh cream, wood, garlic, rank, and a peculiar buttery sharpness scrambling all of your senses together in each single mouthful. And if that description didn’t scare you away, then you’ll be rewarded with a life-altering eating experience. Years ago an American food magazine published a recipe for baking this cheese and they had a slew of complaints from readers because the wooden molds the cheese was packed in fell apart during the baking, leaving a stinky mess. It wasn’t until they realized that the wooden cheese forms sent to the states weren’t stapled, but glued (for some reason, Americans don’t like staples anywhere near their food), and the heat of the oven melted not just the Mont d’Or, but the glue holding the container together. But it’s easy to see how anything, or anyone, can become unglued in the presence of such a cheese. Mont d’Or is a special experience and if you find one that’s perfectly ripe, you can just spoon it out of the container without heating it. However baking the cheese brings out its special flavor, especially if you add garlic and a splash of wine, and the texture is like nothing else you’ve ever had. Some folks grind some black pepper over the cheese before baking as well. If you find one where the wooded box is glued rather than stapled, use a sturdy clip to clasp the box firmly closed during the baking. (And be careful removing it if it’s made of metal, since it’ll be hot.) Outside of Europe, it can be difficult to find. I’ve given a few sources and tips below if you want to try to track one down. 2. Wrap the container of cheese securely in foil, making sure to enclose it so the foil goes up to the top of the outside of the container, but leave the top exposed. Set the wrapped cheese on a baking sheet. 3. Poke eight-to-ten slits in the top of the cheese with a paring knife and slide the slivers of fresh garlic in them. 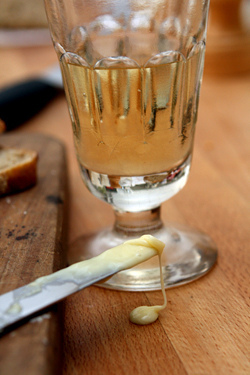 Pour white wine over the cheese, and bake the cheese until it’s very hot – it will take between 20 and 30 minutes. Serve with good bread, although some people like to boil up some new potatoes and make a full meal out of it, often including slices of ham. Pair it with a a good, flavorful white wine (such as Arbois, Chasselas, Sancerre, Chardonnay, or Gewürtztraminer), Champagne, or beer. Oh dear! There goes my dedicated Gym regime for the week! Thank you David! My hubby loves this stuff! Oh. Oh. Oh. Yes. Thanks for reminding me. Why do you always write about the same things that are on my mind??? hhahaha I am on 2 weeks holidays and will be travelling, but after that I’m going to Beillevaire and getting myself a Mont D’Or that I saw in their shop proudly displayed couple of weeks past… Mmmmm…. I can’t wait!! I understand that the makers of the farmhouse Mont d’Or disapprove of it being heated up in the oven. They say you lose all sorts of aromatics. However, everyone does it, so I think it’s just a different experience room temp compared to heated, and both are good. For years, I resisted heating it up, thinking that it would change the character of the cheese. But on a trip to the Jura, the cheesemakers I spent time with heated theirs up with garlic and some local wine splashed over it. It does change the cheese but it’s pretty extraordinary warmed through. This is always my Xmas evening supper treat with small potatoes roasted and dunked whole – yum! I love this cheese. It’s a rare treat but when I do give in to the temptation, we have it with baked potatoes. Crispy potato skins, floury flesh and the creamiest of melting cheese – I can’t think of a more decadent dinner! We’ve made this Mont d’Or fondue with garlic and white wine and I agree that it is amazing and spectacular. I love seeing them at the market in a pyramid of sizes. I served this once, and went to great effort to get it out of its box and onto the cheese plate . . . I clearly didn’t understand how runny it would become at room temperature. Nevertheless – it was quite wonderful. 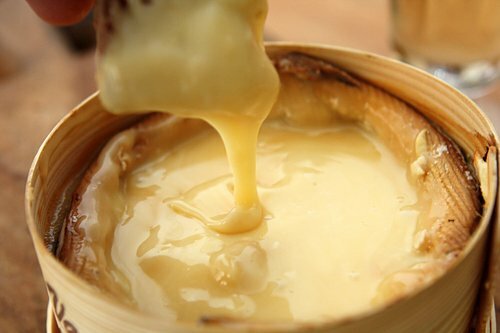 When I first had Mont d’Or, the man offering it to me said, “sometimes people die eating this cheese, but its worth it”. And it is. Sweet baby Jesus! As a lover of all things “cheese” this has to be the pinnacle. Haven’t had this cheese in years. Put it out of my mind because it’s so hard to find here in the US. But now, thanks to you, the sleeping beast is awakened and this weekend’s quest will be to find this cheese. David, you recommend serving this with champagne. Would you recommend substituting the champagne for the white wine in heating the cheese? “become unglued”… a wonderful turn of phrase. Thanks for bringing a smile to my face this morning. I think I’ll try to find some ways to become unglued today! As words go, goopy and kerfuffle are among my favorites. My alltime favorite “fondue” for two! thank you the great website David. just a tiny correction, in Switzerland the certified Vacherin Mont d’ Or is made with thermised milk and not pasteurized, what shouldn’t affect the taste of the milk… . the reason are some cases of listeriosis in the past. but no worries, I would still take the absolute raw french version… (except when pregnant!). Goop de grâce, but what a way to go. This was my friend Hanna’s favorite cheese when we were in Paris together. We didn’t realize it had a season and ate a ton of it when we first go to Paris, in January and February and then were disappointed when the fromagiers stopped selling it. Now I understand why, and when I go back to France, I will make sure to be there in the winter so I can eat as much of this cheese as I please. 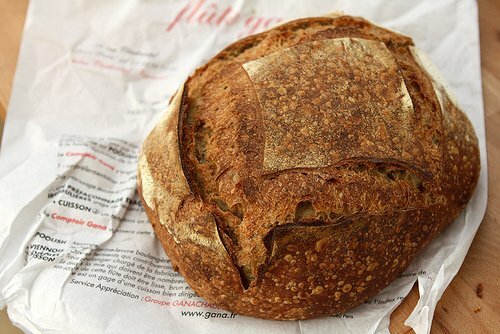 Its especially good with bread from Du Pain et Des Idées. Although that makes for a rather expensive bread and cheese board. Catherine: Yes, it is thermised. In France, they do say pasteurisé and that’s how it reads in cheese references books and on websites, like Murry’s (listed at the end of the post.) I do find the Swiss versions taste different although I love the cheeses of Switzerland, like Gruyère, Vacherin Fribourg, and others. 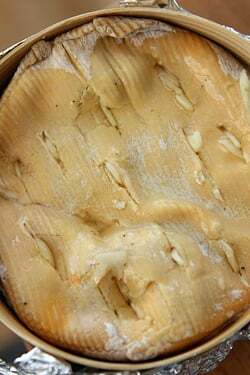 françois: Yes, all those other French cheese are great (although I’m not a fan of Morbier, which tastes rubbery to me) – I’ve linked to visited I’ve made to the ripening caves in the Jura for tasting Comté, Bleu de Gex and other lovely cheeses. *swoon* – love the wines of the Jura as well, although they’re harder to come by than other wines. Eliza: This cheese was pretty inexpensive; I paid €8 for it, although I saw one at the Monoprix the other day for €5,80. But yes, with that bread, I would imagine it’s a superb experience…at any price. Alan: Ha! That’s pretty funny…I can imagine it was quite a mess – albiet a delicious (and goopy) one. Oh, David. Reading this was murder by envy. Here in Tennessee, no Mont d’Or within sight. We love the Mont d’Or here on the Riviera and have a round brown pottery especially made to fit it perfectly and use for the oven – it even says Mont d’Or on the side! Can’t recall where we got it but probably a ‘give-away’ from the Fromager some years ago. Before heating we tuck herbs (thyme goes perfectly) into the cheese and with lots of little holes made in the top with a skewer, pour on some alcohol and into the larger hole made by the thyme. Then drink a glass of the same when eating the cheese. Currently we are favouring dry Vermouth, but you can use white wine or almost anything else. To eat the hot “gloopy” Mont d’Or we like to serve celery or leaves of chickory (called endive here in France) – I suppose to make ourselves believe we’re being healthy!! Tiny potatoes are also a favourite accompaniment. A truly decadent meal but oh so wonderful and it makes the winter storms really worthwhile. Oh yeah. One of the reasons for remaining in Europe. Sheridan’s Cheesemongers here in Dublin is my source for this. Must pick one up soon. Been too long since the last one. Goopy is a wonderful word which conveys everything it should. Use it frequently… but honestly. Love, love soft, runny, ripe cheeses. This one goes on the list of things to try when there. You could probably just use a good sized paper clip to hold it together if it’s glued. I’ve never tried this cheese, but love “goopy”. Hopefully I can find it somewhere. 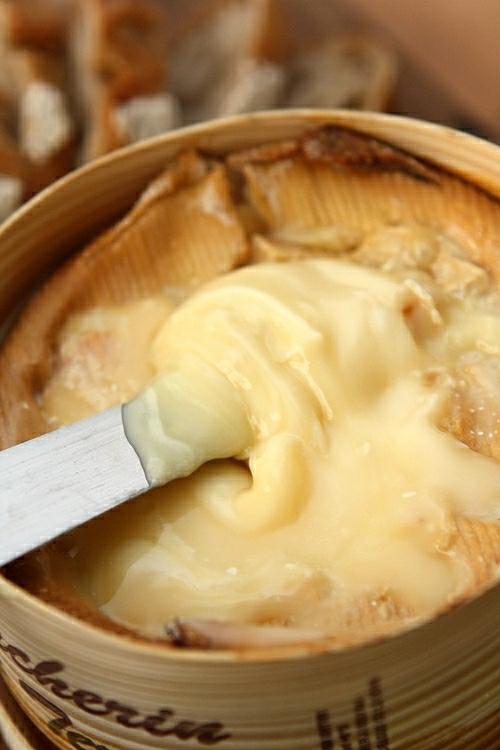 Mont D’Or looks wonderful… Makes me imagine a thermal nuclear version of Epoisse – a def must try when I’m in France next! Oh my! I’m officially on a Mont d’Or quest. I love that there are protected cheeses. I love their bitterness and if you have any chance to try it I think it is worth every penny. 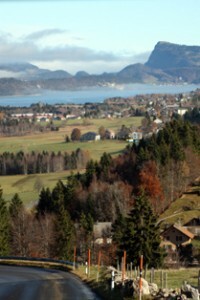 Anyway, I’m travelling to France and the Jura region is in my way so I’ll try Mont d’Or. Thank you for the recommendation! This cheese looks fantastic, and thank you for the suggestions about where to find it. However, I don’t think I will have much luck here in canada. Is there any other more commonly found cheeses that the taste might be similar to? 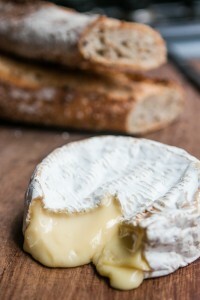 From the photos it looks similar to Brie, but the Brie we have here is much lighter in colour. I have never tasted this cheese before but will definitely buy some when it becomes available next fall when I am in Paris. What do I do with the leftover cheese? Can I reheat it? Lactose Intolerance be damned, I must try this! For those having trouble finding it, I just found that Murray’s cheese has it in-season, so you can order it online – and you can sign up for an email notification when it’s back. I agree that a perfect Mont d’Or is the ultimate cow’s milk cheese. I never heard of heating it, but your method sounds heavenly, and especially if you suspect you have a good, but not perfect, one. Why not do the same thing with Camembert (the second best cow cheese, in my opinion), which is easier to find and available all year? Have you tried this? We love this cheese! We vary your recipe by using dry sherry instead of white wine, and we put the wooden lid back on and seal the whole box in aluminum foil before baking. We refrigerate leftovers, then spoon out the cheese into a bowl (staples and microwaves don’t mix) and pop it into the microwave to re-heat/melt. Still yummy. Lactose intolerant and high cholesterol – but So What!! Thanks for posting, and thanks Val for letting me know about Murray’s…saves search time. We had at one time a crisis in Switzerland because of the raw milk Mont d’Or and a salmonella problem; since then the milk has to be thermised (which, I think, is not the same as pasteurised). I remember the scale of ‘cris de deséspoir’ this measure brought out of our mouths – we only very reluctantly got ‘used’ to the not raw milk cheese. But this all is water under the bridge and we have gone ‘back’ to loving the Vacherin Mont d’Or with all our heart. I love it at room temperature and also slowly heated up the way you described it. But every time I eat it I fear that I surely will die now; it is such a terrific (terrifying!?! :) or what?) experience. It IS heavy on the system but well worth it! Some things just have to be had. It sounds incredible, but at $40 that Murray’s charges I think I’ll wait until I get to Paris. Love all the new words. I’ve heard so much about this cheese and looked longingly. Thanks for the total scoop on it David! Is there any chance I’ll be able to find this in Paris in early May? I’m guessing it thins out by March based on your description, but I would love to try it if I could hunt it down when I visit! I hope I can still find it down here on the Riviera! I’m headed to the store tomorrow! Thank you and fabulous pictures! OMG- I’m dying reading this. Any chance I’ll be able to find one someplace in late April when I arrive? I should have grabbed one the last time I was in Paris- December 2 years ago! Jennifer and Amanda: The season pretty much ends in early May although you can likely find them. Can’t say which fromagerie will have them, but if one doesn’t have them, you can perhaps find another that does. My husband recently brought home not one, but TWO of these wheels of sin. They were both amazing. Leave it to David to come up with the unique and tantalizing – my mouth is watering. OMG. Coming in September…. Gonna miss it!?! I have started dieting now to leave extra room for the cheese and pasteries…. Groan…! Oh my. I wish Australian rules weren’t so stupid about raw milk cheese so I could try this. I absolutely concur that special occasions are necessities for indulging in wonderful foods and beverages. Daily. Sometimes even more frequently. What a TREASURE of a post!!!!!! Thank you so much. Yes, it is very reminiscent to Torta del Casar from Spain. It’s a glorious, stinky cheese that when ripe, has to be eaten with a spoon! MY MY! 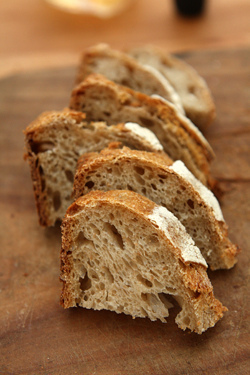 Since Spanish bread does not live up to what you have in your photograph, spooning it is just fine. It’s also seasonal and about twice as expensive as your golden find. Oh my! I want some of this right now. And I love that bread, too. I need to get my hands on one of these things. David, have you ever had Serra da Estrela cheese? It’s a Portuguese sheeps milk cheese made with thistle, and it looks very similar to this when it’s young (they also sell the aged version which is good but not nearly as amazing). Except you don’t need to bake it – you just cut off the top of the ball, and the inside cheese is runny and looks similar to the viscosity of this cheese after baking. If you ever see it, be sure to try it! Kristen: I’ve only seen pictures of that cheese – (I’ve not seen a lot of Portuguese cheeses outside of Portugal) – but it does look great. And I’ll bet the thistle adds a wonderful sidenote of flavor. Antonia and Rosa: Ditto on the Spanish cheeses. We get Manchego here in some fromageries, but not many other Spanish cheeses. I’ve had some wondeful cheeses there. Are the pasteurized versions imported to the US a pale imitation to the unpasteurized version you buy in France? A good option for those of us stateside is the Winnamere from Jasper Hill Farms. It’s highly seasonal as well, and you probably won’t find it at your local grocery store, but if you have a specialty cheese shop near you, ask for it. You can also order one online, but it’ll cost you. So worth it, though. It, too, is “coulant” (runny) and is wrapped in spruce bark. However, the Winnamere is a washed rind cheese–no complaints from me on that front. The flavor is spectacular. On a different note, as the comments section on other posts is closed, I’m having a hard time finding a restaurant you recommend, similar to Bistrot Volnay and Septime, that is open on Sunday. Anything off the top of your head that is open Sunday? Thank you so much! There’s a list of places in my post, Sunday Dining in Paris. Places like Septime would not be open on Sunday in Paris, I’m afraid. Also obscenly good on braised brussel sprouts. Only serious rival: Brézain (lait cru). Putain, c’est bon. Oh, SO good! I’ve always found mine at Zabar’s in NYC. And, darn it! I was just in New York last week and didn’t think to get some. I didn’t know about adding garlic and wine, so now I must go in search of Vacherin in Maryland. That wonderful goopy cheese and Meyer lemons – two delights of winter! Who knew that the three words “funk, rank & barn yardy” could be used to describe something that is supposed to taste so good ! I grew up in the UK and we spent our summer holidays traveling around France and sampling these amazing delights. Brings back memories. I saw a Mont d’Or cheese in my local branch of Waitrose last night but resisted buying. It cost 8 pounds 70 and weighed 280g. If Berkshire branches have it then I’m sure it could be should at the Oxford Street and Marylebone High Street branches in London which typically have later opening hours than speciality cheese shops. The packaging was stapled by the way. Hope this is helpful. My very favorite cheese in the whole wide world. I miss it here in the United States. There is a cheese from a Wisconsin cheesemaker that replicates the flavor well. It is called Rush Creek Reserve and is only available in the winter months starting in November. It sells out quickly so seek it out early. Thanks. I’ve not heard of that cheese in the US, but I see they sell it at Murray’s in New York. Looks very similar! When I read your post here, David, I swooned and made my way to Formaggio Kitchen. Unfortunately, their Mont D’or was a little pricey for my taste ($34 per round, oof!). Instead they recommended a Winnimere from Vermont. ( Technically just as pricey, but able to buy a much smaller round!) And boy oh boy, is it delicious!! Thank you for the lovely cheese inspiration! RRRRHHHHHOOOOOOOOOOOOO !!! I just ADORE this dish ! We like to do this in summer, dans les braises du BBQ ! I let out an audible gasp (decidedly positive) when I saw that first photo. Love the descriptions….goopy, barnyardy, funk, rank, and brain wreck. They made me want to try it even more! I’ll have to see if I can hunt some of this divine stuff in Sweden. I would take a bath in that cheese if I could. One of the Japanese supermarkets where I live has 3 wheels of this cheese when I passed there on Friday – now they are all gone. At HK$175.00 a piece (about €17.50), they are more expensive that what you paid for, but then again, this is Hong Kong. The only way I could justify bringing it home is if I invite a few friends over. 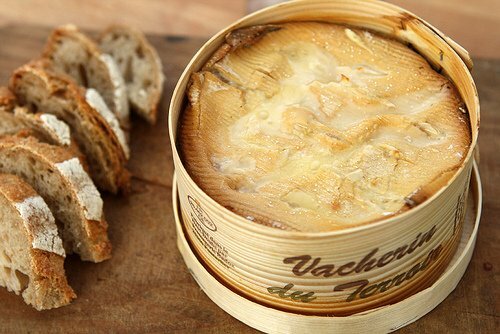 Now, I’m kicking myself…..
Oh my, we always looked forward to Vacherin season in Geneva. It is great in fondue, but unfortunately can’t get it in the US. Eat some for me. In Madrid, I’ve found Mont d’Or in el Mercado San Anton as well as in el Corte Ingles gourmet. Despite being french, I have never tasted it, but I have already tried Torta del Casar, which is delicious and might be very similar. 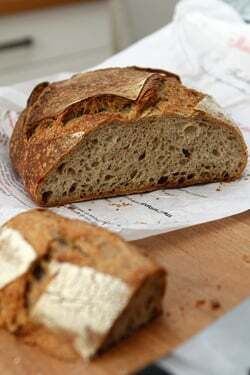 Will give it a try this weekend and thought about using a nice pain d’epices instead of bread to dip into the cheese. When I was in Paris for a week in early December 2009, I bought some of this cheese and ate it with potatoes and ham. It was divine and each Christmas since I have tried to replicate this experience. However I have not been able to find an equivalent cheese plus eating in the Australian summer doesn’t have the same romance as the Parisian winter! I went to Formaggio Kitchen in Cambridge, MA this past weekend. They had Mont D’or in a stapled (not glued) box. They warned me that it going out of season, but when I left they still had about 8 boxes on display. I bought two of the boxes. I’m going to try this for a party I’m going to this weekend. i’m a sf bay area native, but have been living in geneva, switzerland for over a dozen years and we make mont d’or cheese all the time when it’s available. yum! 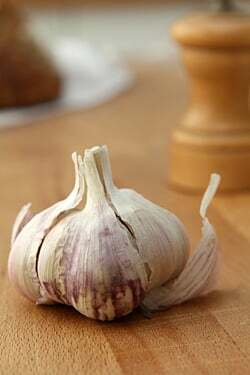 the trick with the garlic slivers is excellent. could you please, before it gets too warm and nobody feels like eating hot, gooey cheese, give us a good recipe for tartiflette? i made one off a youtube video, “tartiflette a mi façon” which is pretty good, but the caramelized onions make it too sweet.. would love to know your take. thanks! It’s been lightly snowing all night and now morning here on the outskirts of Washington, DC, and I must say that the thought of a box of this cheese, warm from the oven, with some little boiled potatoes, bread and that glass (or 2) of white wine sounds unbelieveably perfect…. now, how do I sneak out of work to get to the city to get this cheese… details, details…..
How can I get this in the US? Where? Nikki: I’ve listed some sources for this cheese in the US at the end of the post.